When I was a child, my parents shopped for a children’s Bible that I could read myself. I’m the third of four children, and I grew up when there were no car seats and everyone drank out of garden hoses. So my parents can’t really be blamed for their choice of a Bible for me on the occasion of my First Communion when I was five years old – they were really just phoning it in at that point. 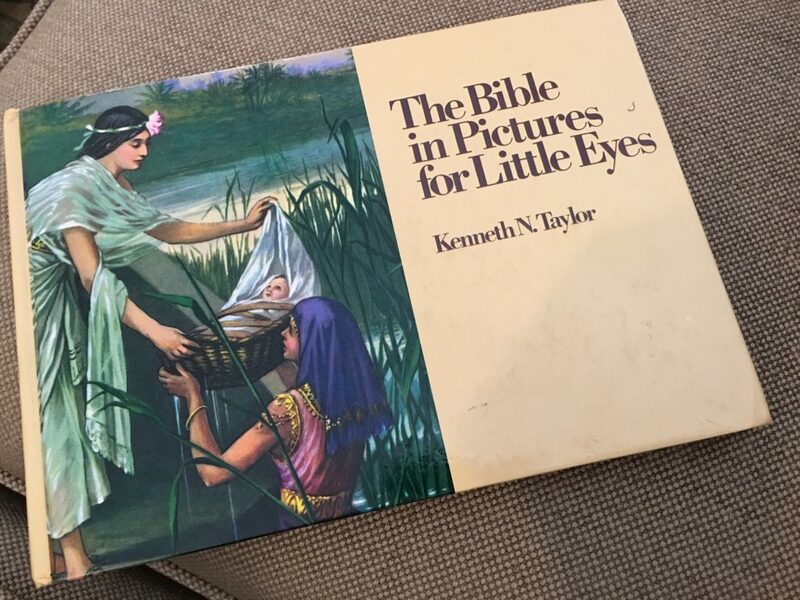 It wasn’t until I was an adult that I realized what a terrifying choice they had made for me: The Bible In Pictures for Little Eyes, written by Kenneth N. Taylor and originally published by the Moody Press in 1956. At first glance, The Bible in Pictures isn’t too terrible. Sure, all of the illustrations show exceedingly caucasian folks, but I don’t know if we can expect much more from something published at that time. The words, though, are something else. In addition to referring to “the bad men who killed Jesus” and a graphic depiction of the stoning martyrdom of St. Stephen, there’s an entire page devoted to Ananias’ death in the fifth chapter of Acts. “Why is the man there on the floor?” (Because he’s dead.) “Did he tell a lie to God?” (Oh man.) This was not the loving God of forgiveness and mercy that “little eyes” need to see. 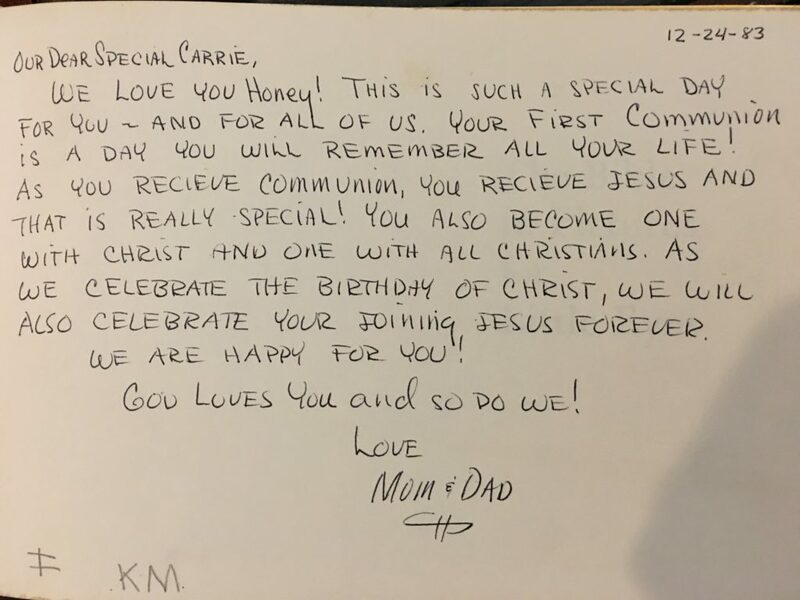 What I will always treasure about this Bible, though, are my dad’s words written inside the first page: “As you receive Communion, you receive Jesus and that is really special! God loves you and so do we!” Even with a dead Ananias, there’s no way I can completely shove this book aside with those precious words to me. Fortunately, the scary theology in The Bible in Pictures for Little Eyes didn’t scare me off Jesus forever. Like most things in parenting, there’s room for some grace for folks who are reasonably trying to get it right. I’m grateful for that grace as I make questionable choices with my own children. These stories describe God’s love and mercy, through Jesus-as-Rescuer (“every story whispers His name”) that is relatable to both my children and to me. The book is beautifully and artfully illustrated, and the stories are just long enough for bedtime reading. I can’t be reminded too much about that “Never Stopping, Never Giving Up, Unbreaking, Always and Forever Love” as I navigate the difficult terrain of parenting, and my children will need to be reminded of that message, too. 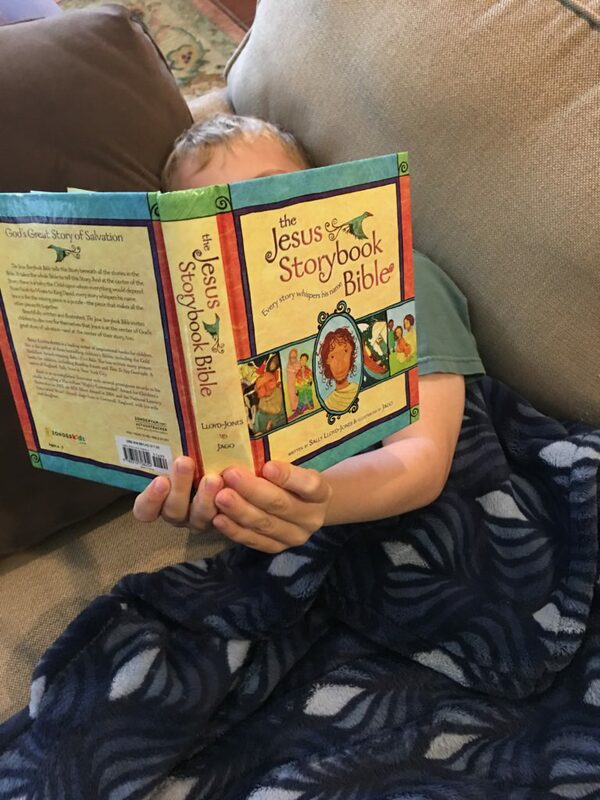 What is your favorite children’s Bible? The “Brick Bible” is the work of Brendan Powell Smith, who was raised Episcopalian and lost his faith as an adolescent, but remained interested in religion as a phenomenon. His take on scripture—similar to that of many fundamentalists—is flatly literal, and he refuses to privilege any stories over any others. His entire project is therefore ironically subversive: packaged in a style familiar to conservative church people, advertising itself as “retold using direct Bible quotes … fun and engaging,” the book confronts the Biblical literalist-inerrantists with, well, graphic portrayals of episode after episode that, taken on these terms, confound any efforts to elicit “family friendly” values or lessons from them. It’s all incredibly meta. That is fascinating backstory! Thank you for sharing.